Home Lifestyle Hippity Hop It's Easter Day! Happy Easter and Happy Sunday to you all! I hope you all have rested and enjoyed your weekend. It has been crazy busy at the vintage nerd household. Today was jammed packed with lots of Easter activities. The kiddies had a visit from their grandparents, received Easter baskets and went on our 4th annual egg hunt which takes place inside our home. This year the kids asked if we could do it in their bedroom and our bedroom so mama complied of course. They went bonkers searching for eggs, it was such a whoot hearing them and watching them. After all the egg hunting was completed we walked over to our local park/playground and the children enjoyed the slides and being with their grandpa (my dad). We ending our day with my husband's mother's family who live nearby and I held my one month old nephew a bit and the children had a chance to play with their other cousin who is my daughter's age. Let's just say the kids are sleeping very well tonight! 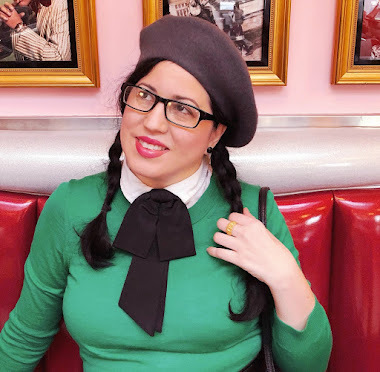 I wore my 1940's pink dress that I wore for my Revlon Legacy Lipstick post HERE. I paired it with a modern cardigan from Maurices, simple pearl stud earrings, some of my Moonglow bracelets, and a brooch from the 1930's with Mary on it. I thought it would be fitting for the day. It was a busy day indeed but the fact that we were together and that the children were so happy has made me equally happy. It is the little things that count and you don't have to do anything fancy or expensive to make your day special and fun. Today was proof of that. Gorgeous Easter outfit! It looks like the kids had a smashing time! I love this outfit! What a great dress. You look so pretty:) The Revlon Legacy Lipstick is totally you! I still have to try mine. I forgot to yesterday:) What a fun day at the park with your family! Did you make that cake? Thoroughly beautiful Easter outfit, dear Daffny. That warm, carnation-esque shade of pink looks so immensely pretty on you. I'm happy to know that you and your family had a terrific Easter celebration. May the rest of the spring continue to be every bit as fantastic for all of you.